This article submitted by Michael Jacobson on 4/11/01. Impaired hearing is a leading disability in newborn babies, but one that is difficult to spot. "It's very prevalent, but it's a silent disability," explained Karla Fleming, a speech therapist at Paynesville Area Health Care System. "They look normal." One in a thousand babies are born deaf, and four or five in a thousand have a hearing impairment, according to Fleming. Brenda Feigum (right) watches as Karla Fleming get Feigum's two-week old daughter, Abigail, ready for the hearing screening test. While babies with hearing impairments may look normal, if they don't get help, they might not sound normal later in life. If a hearing disability goes without notice and without treatment, a child may pass crucial months without hearing the outside world, processing its sounds, and learning the language of humans. They may fail to learn to communicate and fall well behind their age peers, said Fleming. To combat this potential disability, PAHCS has initiated a newborn hearing screening program. The system used to offer screening only through its outreach program, where it was available only on a monthly basis. The small box - which allows mobility in conducting the tests - uses sensors on the head, neck and shoulder to check for electrical responses in the brain to sounds. If the newborn hears the sounds, the electrical response in his or her brain will be measured. Newborns either pass the test or are referred for more testing. The first test would be to repeat the hearing screening to check for a faulty test. If his or her hearing still cannot be confirmed, the child is referred for further testing to determine the extent of the impairment. Treatment of the hearing impairment might begin within three months, and speech therapy might begin within six months for babies with hearing impairments. While a hearing loss can be remedied later in life, this developmental period for the newborn cannot be easily replaced. Normally, babies are learning words, to differentiate sounds, and about human interaction through their hearing. If they can't hear, this is all lost. "What we're preventing," said Fleming of the hearing screening, "is a missed opportunity to treat the hearing loss." If detection waits until a child is two or three years old, Fleming said, the child will have missed all sorts of sounds, such as dogs barking, Christmas carols, birds chirping, and adults conversing. "By that time, the critical period of speech development is lost," she explained. Hearing disabled six-year-olds have had 50 words in their vocabulary at a time when their peers usually have 6,000. "That's the difference," said Fleming. "It's very important." A child whose hearing impairment isn't detected until age two would be two years behind his or her age peers. By detecting the impairment early, the hope is to limit the effect of the hearing disability. Untreated hearing impairments can also have social and emotional impacts, Fleming said. Kids who do not hear might have trouble interacting, because "they never heard any interaction," said Fleming. All sorts of subtle things happen in conversations, which these children would miss. Brenda Feigum, who brought her two-week-old daughter, Abigail, in for testing on Monday, said it's comforting to know that her hearing is normal. Feigum and her husband, Jerome, also had their older daughter tested using the other equipment. "I think it's a good deal," she said. "We're fortunate they do it this early." Earlier detection, she added, will help in treatment. Fleming makes contact with all newborn babies in the hospital. For insurance purposes, follow-up appointments are made to do the hearing screening. 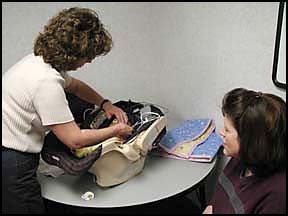 The tests are frequently done with the child's first follow-up checkup with their doctor. Because the hearing screening machine is mobile, Fleming can go to any of PAHCS's satellite clinics to do the testing. Since starting on the first of February, Fleming has tested every baby born at PAHCS except for one, who still may be scheduled. Their goal is to test at least 95 percent of the newborns and to get as close to 100 percent as possible. So far, no hearing impairments have been discovered. Babies do not need to be born at PAHCS to have the testing. In conjunction with the grant from the Lions, the data management of the results are being compiled by the University of Minnesota for five years. The screening test does not insure against future hearing loss, due to ear infections, for instance. Fleming stressed that parents need to continue to watch their child's reactions to sounds and monitor their hearing.